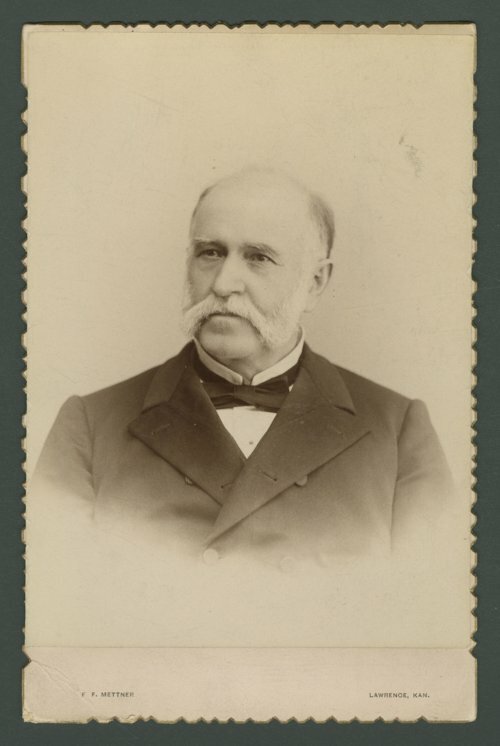 This is a cabinet card photograph of Charles Chadwick, who was Kansas Attorney General from July 30, 1861 to December, 1861. Chadwick was born in Tompkins County, New York on March 8, 1820. He was an attorney in New York before moving to Quindaro, Kansas Territory, in 1857. When Attorney General Benjamin Franklin Simpson resigned to enlist in the Army in July of 1861, Governor Robinson appointed Chadwick as the second Attorney General for the State of Kansas. He started a law practice in Lawrence, Kansas, in 1863. He served as Paymaster General, with the rank of Major, during the administration of Governor Thomas Carney. In 1865, he was elected Justice of the Peace for the city of Lawrence, and was elected Police Judge in 1881. He died in Lawrence in 1900.